We love soup. Often what happens, I add too much rice – I love rice too, and end up with some sort of stew. Determined to make a proper soup this time, I boiled pasta separately and added it back in each bowl – this keeps the grain/starch from absorbing all the liquid and becoming mushy. We used broccoli in this recipe which has great flavor, but if you are making a pot of soup to eat over a few days, an equal amount of shredded Savoy cabbage would be a better choice as I think it keeps better over time. 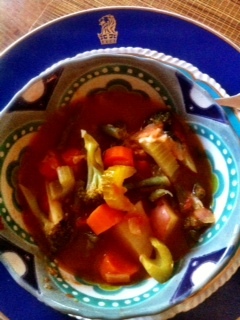 Broccoli can become a bit sour after a few days especially with the tomato base. This entry was posted in Recipes and tagged Basil, Broccoli, Canned Tomatoes, Carrots, celery, Onion, Savoy Cabbage, Vegetable Soup. Bookmark the permalink.